Companies have a growing demand to visualize their data with business intelligence tools. We compared the salaries from across 10 different European countries using Glassdoor, which offers self-reported salary information by location and employer, giving us some key insights into the salaries of people with “Business Intelligence” in their job title. There are few reliable resources available to track salaries in the workplace. Most people are private about how much they earn and a lot of companies choose not to share them. Glassdoor allows access to self-reported salary information by location and employer, and can provide us with some insights into the salaries of the job titles containing “business intelligence.” We collected the salary data from 10 different European countries, including Austria, Belgium, France, Germany, Ireland, Italy, Netherland, Spain, Switzerland, and the UK. To make salaries comparable, we changed them into annual salaries in Euro (GBP/EUR: 1.12, CHF/EUR: 0.88). The figure plots the average nominal salaries per year by country and ranking. 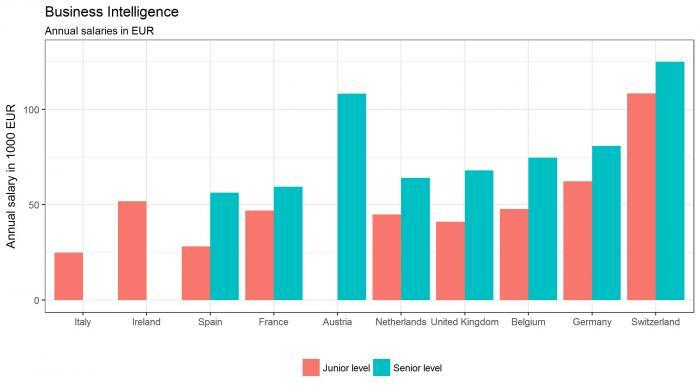 Junior level salaries range from EUR 24,900 in Italy to EUR 108,400 in Switzerland. Germany and Ireland follow closely behind with EUR 62,300 and EUR 51,900. For senior positions in Switzerland, wages are EUR 125,000, making it the clear lead in Europe. These nominal salaries don’t tell us much about the underlying purchasing power. European cities like Geneva and Zurich are famous for being expensive places to live. To take into account the difference in the cost of living, and to compute real wages, we use the OECD price level index. The table below shows what the average annual salary for junior level positions is, with the prices adjusted. It shows that the cost of living in Switzerland is 70% higher than Spain, and so some of the differences in salaries for business intelligence can be explained by the cost of living. However even with these adjustments, there’s not that much that changes in the ranking. Switzerland still stands out clearly with the highest wage, while Italy remains at the lowest. The difference between Germany and Switzerland however, shrinks from around EUR 45,000 per year, to around EUR 12,700 per year.